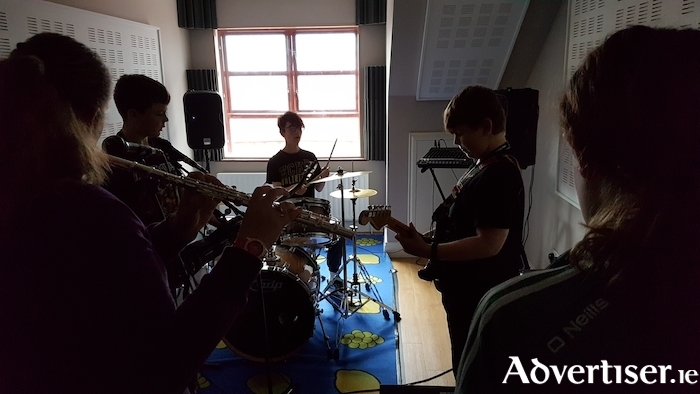 For over a year young musicians from Ballina and throughout Mayo have been taking advantage of an exciting new creative facility. The Core is a resource for young musicians and schools in the Mayo community. It is run under the auspices of Music Generation Mayo and housed within Ballina Arts Centre. At The Core, young people aged 12 to 18 years can engage in instrumental tuition, workshops, camps, and regular performance opportunities such as open mics and showcases. The Core also has a dedicated members only creative space which is kitted out with high quality equipment. The resource has lots of instruments including electric guitars, drums, piano, synths, a range of amplification, PA, and studio recording equipment. Members are introduced to a community of like minded musicians and music enthusiasts from all around the county. They can communicate on The Core private members only group chat and are encouraged to organise collaborations and jam sessions, and they have access to the rehearsal and recording space which they can book and use for practice, recording, or collaborations with other members. Members are not only from the Ballina area but come from across the county to engage in musical activity at The Core. Members of The Core also have access to a range of performance opportunities and get member discounts on all the classes, camps, and workshops.